Sema Ugursandi is a nine year old girl from India. She was born in 1991, and she is one of a family of 2 children. 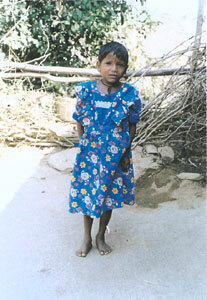 She attends school where she is learning to read and write. Her family has a small plot of land and some livestock. Sema's house is made of mud with a thatched roof and there is a protected water source less than half a kilometre away. The family is Sarna and they speak Ho. If anyone in Sema's family is ill, they can visit a health centre which is less than 5kms away. Sema Ugursandi is one the several children who benefits from the work carried out by Singbhum Legal Aid Development Society (SLADS) which is a non governmental organisation working in Musaboni block of East Singhbhum district in Bihar, considered to be one of the poorest in the country. Since its inception, SLADS has been engaged in mobilising the oppressed Tribal groups and initiating poverty alleviation programmes in the rural areas of East Singhghum. SLADS has also managed to establish a working relationship with Government resources for community development. To combat property, SLADS has developed the following strategy: organising, mobilising and strengthening the existing village groups, building self confidence, leadership and strength among the tribal men and women. SLADS disseminates information about the rights of the people and the Government Programmes that are available. Leadership training and exposure visits for the village group leaders are arranged and the people are taking advantage of the resources available from the Government. SLADS will involve the people in every stage. Programmes will address the problems, and devise methods for solving them using local knowledge and appropriate technology. The area of work will be diverse including the fields of health, education, economic programmes and community organisation and development. To find out more about the work of Action Aid click here.